KFC has some serious egg on its face. The chicken chain said Friday that it would switch hundreds of UK restaurants back to their old supplier as the company's logistics snafu runs into a fourth week. KFC, which is owned by Taco Bell and Pizza Hut parent Yum Brands (YUM), said that 350 stores in the north of the country would be supplied by its original logistics partner, Bidvest, starting later in March. The chain has suffered from 20 days of menu trouble. It started with a chicken shortage that forced the temporary closure of almost all of its 900 UK stores after it switched its supply contract to DHL. 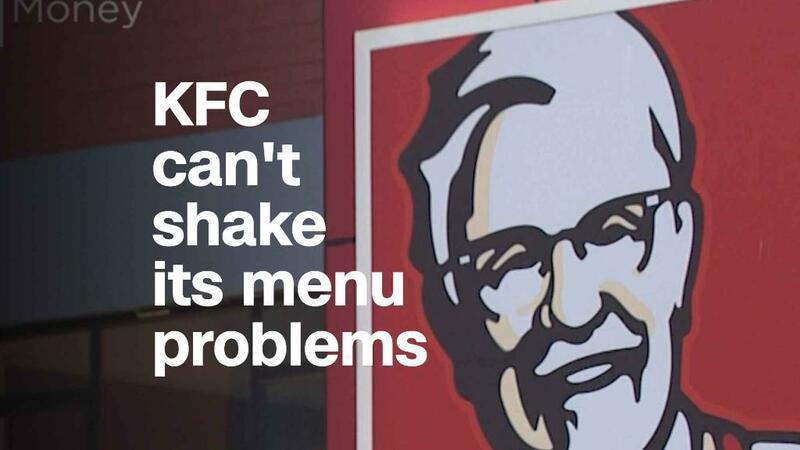 The problem has still not been completely resolved: Most KFC restaurants in the UK are offering limited menus, and two dozen stores remained closed on Friday. KFC has not provided a detailed explanation of what went wrong, other than to say that DHL experienced "teething problems." GMB, a labor union that represents workers at Bidvest, said KFC's decision to switch to DHL had been motivated by potential cost savings. The union said that Bidvest laid off 255 workers after losing the KFC account. The specialist food distribution company said on Friday that it was contacting former employees and trying to rehire them "wherever possible."